Over the years David Phillips has studied a lot of many ballroom dances and at least a little of almost anything else. 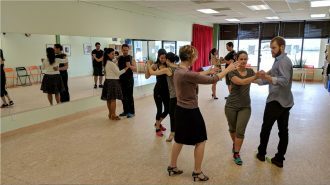 On retiring from a tech entrepreneur career he took up Argentine tango and discovered the dance to engage his mind-body-spirit for the best of his years. He teaches at his Tango Tribe studio in Austin, Texas.